WASHINGTON -- An Iranian fleet of high-speed boats charged at and threatened to blow up a three-ship US Navy convoy passing near Iranian waters, then vanished as the American ship commanders were preparing to open fire, the top US Navy commander in the area said Monday. No shots were fired, an Iranian official in Tehran said the incident amounted to "something normal." 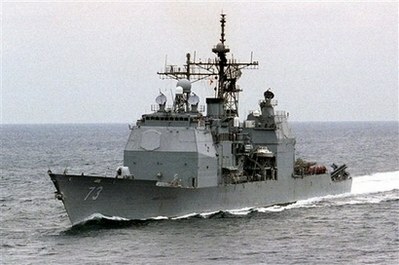 The three US warships -- cruiser USS Port Royal, destroyer USS Hopper and frigate USS Ingraham -- were headed into the Persian Gulf through the Straits of Hormuz on what the US Navy called a routine passage inside international waters when they were approached by five small high-speed vessels believed to be from Iran's Revolutionary Guard Corps Navy. The Iranians "maneuvered aggressively" in the direction of the US ships, said Vice Adm. Kevin Cosgriff, the commander of US 5th Fleet, which patrols the Gulf and is based at nearby Bahrain. The US ship commanders took a series of steps toward firing on the boats, which approached to within 500 yards, but the Iranians suddenly fled back toward their shore, Cosgriff said. Cosgriff was not precise about the US ships' location but indicated they were about three miles outside Iran's territorial waters, which extend 12 miles from its shores, headed in a westerly direction after having passed the narrowest point in the straits. At one point the US ships received a threatening radio call from the Iranians, "to the effect that they were closing (on) our ships and that the ships would explode -- the US ships would explode," Cosgriff said. The boxes were not retrieved, so US officials do not know whether they posed an actual threat. Cosgriff the US ship commanders were moving through a standard series of actions -- including radio calls to the Iranians that went unheeded -- but did not reach the point of firing warning shots. He recalled the October 2000 terrorist attack on a US warship, the USS Cole, in Yemen's Aden harbor by a small boat laden with explosives; 17 sailors died in that attack, which nearly sank the Cole. Defense Secretary Robert Gates, speaking aboard the USS New Orleans pierside in San Diego, told reporters on Monday "it would be nice to see the Iranian government disavow this action and say that it won't happen again." Gates said there had been two or three similar incidents -- "maybe not quite as dramatic" -- over the past year. He offered no details, but one Navy official said there have been several similar incidents that involved "aggressive maneuvering" by small boats in the Gulf. In one instance, a US Navy vessel fired warning shots across the bow of the small boat, said the official, who requested anonymity because details of the earlier encounters have not been made public. The official said that while at least one of the small boats in the Sunday confrontation was flying an Iranian flag, that was not the case in the earlier incidents. Thus, while there is suspicion that they may have been Iranian boats, it is not certain. The latest incident began Sunday about 8 a.m. local time and lasted about 30 minutes, Cosgriff said. It was followed on Monday by an unusual but apparently unrelated incident in which two US Navy F/A-18 fighter jets were destroyed in an aerial collision over the northern Gulf. The three aviators involved were plucked safely from Gulf waters and returned to their ship, the USS Harry Truman. In Tehran, Iran's Foreign Ministry suggested the Iranian boats had not recognized the US vessels. Spokesman Mohammed Ali Hosseini played down the incident, saying it was "similar to past ones." In his remarks to Pentagon reporters, Cosgriff said US Navy ships routinely have contact with Iranian naval vessels and that usually the correct procedures are followed without confrontation. In fact he said the three-ship Navy convoy involved in Sunday's incident had earlier exchanged normal communications with some Iran shore stations and with a passing Iranian Navy ship. At the State Department, spokesman Sean McCormack said the United States would "confront" hostile Iranian actions against US interests and those of its allies in the region and called on Iran to halt "any provocative actions." Historical tensions between the United States and Iran have grown in recent years over Washington's charge that Tehran has been secretly seeking to develop nuclear weapons and supplying and training Iraqi insurgents using roadside bombs -- the No. 1 killer of US troops in Iraq. At about this time last year, Bush announced he was sending a second aircraft carrier to the Gulf region in a show of force against Iran. The US Navy quietly scaled back to one carrier group several months later. But while the two were there, they staged two major exercises off Iran's coast.